Here’s the photo I wanted to share yesterday (found it! a day late!) to show that after bleak mid-wintery days the sun does (eventually) shine. That is definitely a comforting thought when the bleaks creak us down. But there’s more to take away from this photo. It’s not a red rose blooming in winter, but a red bush (kinda sorta close.) 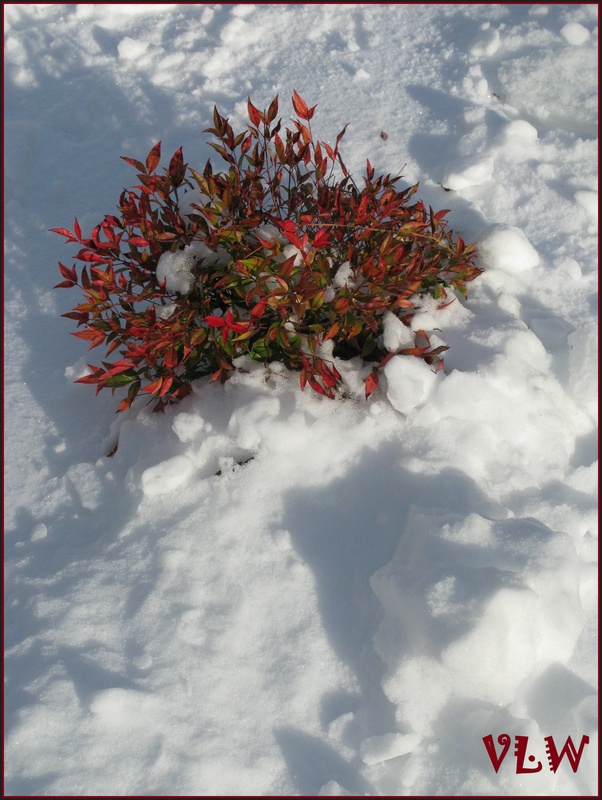 Seeing the beauty of this red bush in the snow reminds us to REJOICE! It’s a happy sort of bush, still blooming with color in the cold of winter. Isn’t that what Advent is all about? Light in the darkness? Joy to the World? red bushes blooming in the snow. This entry was posted in Advent, SNAPSHOTS & WHATNOTS and tagged Advent, faith & beauty, inspiration, Inspirational photographs. Bookmark the permalink. Actually, with a 65 degree day here, I wouldn’t mind at least one snow event before spring kicks in. But I appreciate your message of hope, V!